LET is currently the most-numbered examinees being administered by the Professional Regulation Commission. The exams are scheduled twice a year to cater the growing number of aspiring registered professional teachers for both elementary and secondary levels. To pass the exam, an examinee must obtain an average rating of not less than 75% and must have no rating of lower than 50% in any of the test. Passing the Licensure Exam for Teachers (LET) isn't easy without understanding the full coverage of exams. Generally, exam for elementary level covers topics from General Education (GenEd) 40% and Professional Education (ProfEd) 60%, while in secondary level, GenEd 20%, ProfEd 40% and area of specialization 40%. 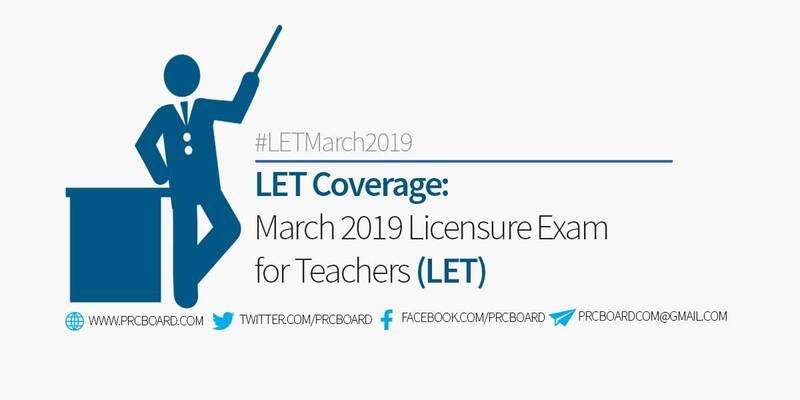 Here is the exam coverage of the Licensure Exam for Teachers (LE) for March 2019. FILIPINO (MGA BATAYANG TEORETIKAL: Introduksyon sa Pag-aaral ng Wika; Panimulang Linggwistika, NILALAMAN: Wika; Panitikan; Metodolohiya, Pagtataya at Ebalwasyon, at Kagamitang Pangturo). PHYSICAL SCIENCES (INTRODUCTION-Nature of Science, Chemistry, Atomic and Molecular, Chemical Bonds, Conservation of Matter and Stoichichiometry, Gases, Liquids and Solids, Acids and Bases, Solutions, Chemical Thermodynamics, Chemical Kinetics and Equilibrium, Organic and Biochemistry , Nuclear Processes, PHYSICS: Physical Quantities and Vectors, Mechanics, Electricity, Magnetism , and Electronics, Thermodynamics, Modern Physics, Light and Geometries Optics, Earth and Space, Astronomy , and Environment). MATHEMATICS (Arithmetic & Number Theory and Business Math; Basic & Advanced Algebra; Plane and Solid Geometry; Trigonometry; Probability and Statistics; Analytical Geometry; Calculus; Modern Geometry , Linear and Abstract Algebra; History of Mathematics, Problem Solving, Mathematical Investigation, Instrumentation and Assessment). SOCIAL STUDIES/SOCIAL SCIENCES (Trends and Issues in Social Studies; Research; Geography; Sociology and Anthropology; Politics/Governance/Law-Related, History: World History and Civilization I; World History and Civilization II, As ian Studies; ECONOMICS: Micro-Macro Economics-Economic Planning and Strategies; METHODS: Teaching Approaches in Secondary Social Studies; Productions of Instructional Materials for Social Studies; Building Bridges Across Social science Discipline ( MAKABAYAN as a core learning area in Basic Education); ASSESSMENT: Assessment and Evaluation in the Social Sciences/Social Studies). VALUES EDUCATION (FOUNDATION OF VALUES EDUCATION: 1. Philosophical and Ethical Foundations of VE; 2. Socio-Cultural, Anthropological & Legal Bases of VE; Psychological Theories of Values Development; PERSONHOOD DEVELOPMENT: Personhood Development; 2. Dynamics of Intra and Interpersonal Relations; 3. Psycho-Spiritual Development; 4. Management of Behavior Problems; TRANSFORMATIVE EDUCATION (SOURCES OF VALUES AND FACTORS IN VALUES ED): 1. Family Life and Filipino Values System; 2. Education for Human Rights and Responsible Citizenship; 3. Foundations of Gender Studies; 4. Peace and Global Education; 5. Information Technology and Human Development; 6. Moral Issues and Concerns in Contemporary Living; WORK ETHICS AND COMMUNITY SERVICE: COMMITMENT TO SOCIAL RESPONSIBILITY AND ACCOUNTABILITY: 1. Career Development and Work Values; 2. Values Education through Community Service; APPROACHES AND METHODOLOGIES: 1. Facilitation: Theory and Practice; 2. Teaching Approaches and Strategies in Transformative Education; 3. Values Integration in the School Setting; RESEARCH AND EVALUATION: 1. Behavioral Statistics, 2. Development of VE Instruction Materials and Assessment Tools, 3. Research in VE) . MAPEH (Foundations of MAPEH; Methods and Strategies of Teaching MAPEH; Coaching and Officiating of Sports Events, Dance Competitions and Music Activities; Organization and Management, Research, Special Education in MAPEH. PHYSICAL EDUCATION: Anatomical, Mechanical and Physiological Bases of Movement; GYMNASTICS: Philippine Folkdance; Team SPORTS, Aquatics; International Folk Dance and Other Dance Forms; Athletics, Individual, Dual and Combative Sports. HEALTH EDUCATION: Personal Community, Environmental Health, Safety Education and First Aid. Health Practicum. MUSIC: Philippine and Asian Music; Solfeggio and Applied Piano, Integrated Music Theory, Music Literature, Choral Works and Conducting and Randalia Playing Instrumentation. ART EDUCATION). Here's the program for March 2019 LET, courtesy of PRC. Disclaimer: This article does not claim ownership on any of the info posted. The sole purpose is to disseminate quality information for March 2019 LET examinees. Meanwhile, readers may always refer to PRC official website and at to our social media accounts via Facebook and Twitter for updates. Pls help me to pass the exam pls. What do you mean my cut off? Do you mean na kahit marami ang nkapasa hindi nila ipapasa dahil may limit. So ibig bang sabihin na useless lng ang pagod, hirap, pera at panahon na inilaan para sa exam na ito? Ako, second na ako nag take ng LET pero diko maipasa pasa. Sabi ni mama dahil raw sa kamalditahan ko sa pagsagot ko sa kanya etc. but I think she has a point but maybe it's a scientifc beliefs. Well nvm. Hoping that this coming September 2018 mag take ako sana makapasa na ako. Sana makuha q na to.. kapagod ng wlang trabaho.. God help us. Pwede ka pa rin namang mag work kahit hindi ka pa pasado. Just do the right thing. Dear God makapasa na po ako this time,hirap na po mag abroad malayo sa pamilya. Review lang po nang maige. And of course..pray to God. I claim to pass the LET In Jesus Name! I claim and pray that I will pass the LET this 2017 in JESUS MIGHTY NAME. amen! i pass the exam thru divine master lord god. electronics technology po natapos ko kumuha ako ng 18 units prof. education .. balak ko mag take this coming september 2017.. ano po major ko? TLE po ba? Opo I think some of these will come-out in Gen-Ed and Prof-ed. Hello, allowed ho ba aq na mag-file? nawala po kc ung NOA ko, anu gagawin ko? repeater po ako. salamat sa sasagot. I hope this will be the last and final exam on sept 2017 hope i can make it. I hope and pray i pass the LET exam this coming sept.
You have been good to me all my life. I don't deserve your unconditionally love for me. The fact that I have so many blessings in my life is to be grateful for me. Please help me to study for exams so that I may pass. I have been through so much failures before, help me to gain victory. Thy will be done in Jesus name, Amen. Everything will be on Jesus hands, I trust Him. I will be a Licence Professional Teacher, I proclaim. I claim it in Mighty God Amen.This is for me and for all takers we are going to pass this exam believe it. nasaan na ang top 1? well, finally we already receive the room assignment. God well bless us always guys I know God is there to help us and I know all of us will pass the exam , dasig lang mo !!!!! Pwd po ba take exam kahit year 2006 p ang last exam ko...ano po ba requirements? im a BS Medical Technology graduate, last 2015 i just finished may law school (LLB grad. )and recently i finished my earning units in BSED.ano po kaya ang pwede kong field of specialization? kasi mas priority ko sana ang Social science since i am a law graduate kesa biological science.Anyone po kung ano dapat ang field of specialization sa akin?? Study and pray.We will all pass!! Good luck to all takers! Anyway, meron po bang BSIT graduate dito na nagtake ng 18 prof ed units para makapag board? If so, ano pong pina major sa inyo para sa upcoming board exam? Thank you and may God Bless us all! Pwede po ba magpursue ng major not related to your undergraduate course? Hello po! ano po kaya ang field of specialization ko? i graduated BSIT major in Computer Tech tapos kumuha po ako ng 18 units. Is it Soc sci or TLE? Hello po! I graduated BS Industrial Technology major in Comp. Tech.. tapos kumuha po ako ng 18 units.. ano po kaya ang field of specialization ko? Good day po. Ask ko po sana if kailangan pa po ng notice of admission for repeater. Panu po pla mam if yung gender mo ay mali tapos nagpgwa ka ng afidavit e aacknowledge niu pa po ba kahit hindi latest ang pingwa ng afidavit? Pero nka lagay nman don for board exam purposes..
GOOD LUCK! KAYA NIYO YAN!!! paano po ba malalaman kung ilan percent lang ung nkuha sa let exam?